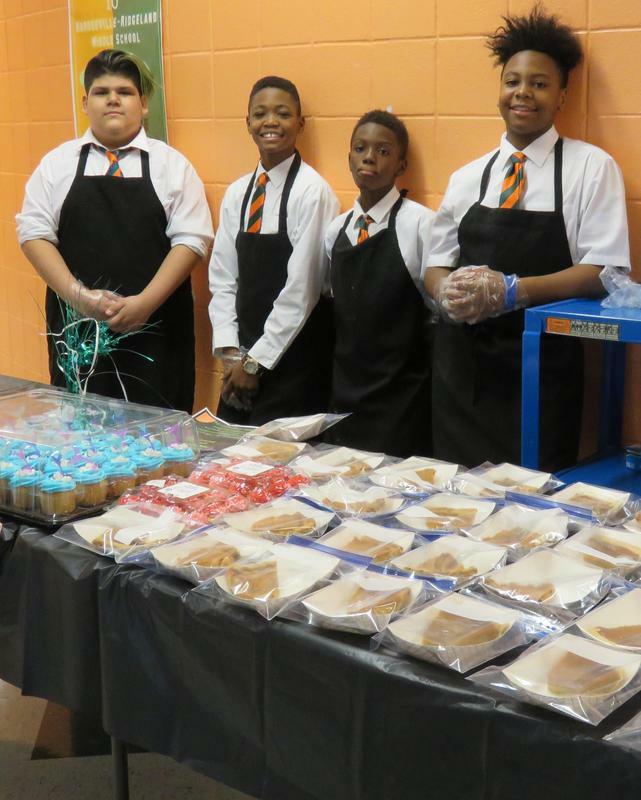 The Boys II Men Mentoring Program at Hardeeville-Ridgeland Middle School (HRMS) kicked off the new year with a bake sale on Thursday, January 24. The fundraiser began at 11:30 a.m. and ended at 2:00 p.m. Items for sale included cookies, brownies, cake, and sweet potato pie. Proceeds will be used to fund a Parent Appreciation Dinner hosted by students participating in the program. Donations to help support this event can be dropped off in the Hardeeville-Ridgeland Middle School office, addressed to Boys II Men of Jasper County. Hardeeville-Ridgeland Middle School partnered with the Hardeeville Police Department to sponsor the Boys II Men Mentoring Program, which seeks to cultivate positive development of adolescent boys in a safe and exciting team environment. Each Thursday the boys dress to impress in khaki pants, a white collared shirt, and an orange and green tie. The bake sale fundraiser was supported by Mr. S. Woodward, Chief of Police of the Hardeeville Police Department; Mr. T. Ancrum, JCSD Director of Student Services; and Mr. E. Bellamy, Principal of HRMS.